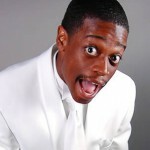 Born Frank Williams III on December, 10, 1984 in Sumter SC, comedian Shuler King was raised in a household strongly based on religion and education. 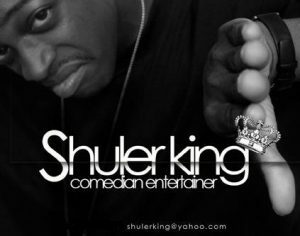 Throughout his youth Shuler King was known as the one with all the jokes, despite all of his personal obstacles. Growing up, he and his siblings were exposed to domestic violence and drug abuse. By the time he was in middle school most on his friends sold drugs. At age 15 Shuler King had joined them. “I wanted to make my own money and feel like my own man, and at that time it felt ok.” As time went on he started to feel different about what he was doing, and slowly he departed from it. Coming out of high school he never wanted to go to college, because he felt he wouldn’t get accepted anywhere. ” I was smart, but I never applied it in school. The curriculum was boring to me, because I felt that it was useless to everyday life.” Shuler attended Sumter High School were his mother, Mrs. Williams teaches English. His mother was the reason that he filled out a collage application at all. To the surprise of many he ended up attending and graduating from the University of South Carolina with a Bachelor of Arts degree in Media Arts in 2007. During his attendance he joined the Mighty Illustrious Zeta Zeta Chapter of Omega Psi Phi in the Spring of 2007. Regardless of any experiences that Shuler King has had or will have in his life, one thing that has always been concrete is his gift of comedy. On April 14, 2004, when he was just 19 years old he decided to take the stage at the NCO Club at Shaw Air Force Base. The Acts that night were Big Kenny, Barbra Carlyle and Sugar Bear. That night was proof that Shuler King could do just what he thought he could. Ever since then he has been stirring up a fuss at the comedy clubs around him. He has made appearances at the Comedy House Theater in Columbia, SC, The Uptown Comedy Corner in Atlanta, GA, Billy D’s in Columbia, SC, Fat Katts in Hinesville, GA, Club 118 in Sumter, SC, NCO Club in Sumter, SC, Omega Psi Phi Frat House Comedy Night in Charlotte NC, Club Rolex in Greenville, SC, The University of South Carolina in Columbia SC, and is now permanently booked for the Capital City Ques All Black and All White Affair at the South Carolina State Museum in Columbia, SC. Shuler King has shared the stage with a number of comedians such as Shawty, Dave Martin, Barbra Carlyle, Big Kenny, Arnesto, Sugar Bear, Damon Williams, Zoo Man, and Dirty South, just to name a few. Shuler King A.K.A. Frank Williams III is a work in progress, a complex individual who invites the public into his life through the gift of laughter.